I personally heard Eric's Trip first when I was maybe 14 years old, so 1994. I had picked up the "Peter" EP on CD (actually the first CD I ever bought in my life)at Randy's Records. Randy's is a blog in itself for me. That was the record shop I hung out after school almost everyday from age 12-16 when I left Owen Sound. Anyway back to Eric's Trip. I had picked it up because they were named after a Sonic Youth song from my favorite album at the time "Daydream Nation". The "Peter" EP was a very good intro to the band seeing as it was and still is one of my favorite releases by this prolific band. I soon thereafter got the "Love Tara" cassette on SubPop records. Still to this day "Peter" and "Love Tara" are my two most listened to albums from the band. Now about Eric's Trip; they are Canadian hailing from Halifax. They are an awesome fuzzed out and crucial indie band. They do have a strong influence from Sonic Youth but with their own thing. Their low-fi recordings really define their sound. They were definitely into doing home recordings and it shows more on some releases then others. But seriously all of their recordings have come out great even their self released cassettes. I have never lost interest in this band because honestly they are one of the most DIY bands that ever "made it" in the 90's indie/grudge scene. They always stayed true to their own sound and never conformed. This actually never ended up effected their progress as a band. I truly respect that so much. Eric's Trip formed in 1990 when musicians Rick White and Chris Thompson of The Forest joined Julie Doiron and Ed Vaughan (who was later replaced by Mark Gaudet of Purple Knight). 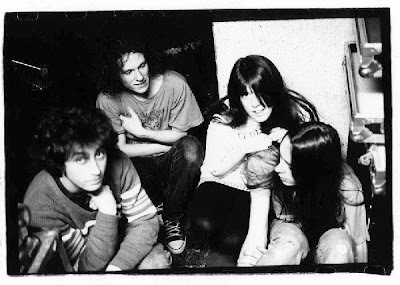 They took their name from a Sonic Youth song and emulated the distorted guitar of Dinosaur Jr., the folk leanings of Neil Young, and the lo-fi aesthetic of Sebadoh. Rick White described their sound as "sappy melodic pop music on top of thick distortion." Gaudet's description was more succinct: "dreamy punk". Eric's Trip achieved prominence as the first Canadian band to be signed to Seattle's flagship grunge label Sub Pop in the early 1990s, the same label which rose to alternative rock immortality after releasing Nirvana's early work. Another two Atlantic Canadian bands, Jale and The Hardship Post, were signed to Sub Pop in subsequent years. The band had a minor hit in alternative circles with the single "Viewmaster", from 1994's Forever Again. The band broke up in 1996, but reunited in 2001, and have played at the Sappy Records Festival in Sackville, New Brunswick starting in 2006, up to the most recent in 2009. They also played a series of shows in 2007, including a show at the 2007 Halifax Pop Explosion. Here is the trailer for the Eric's Trip documentary. *are the ones that have touched me the most, I think it is a nostalgic thing though. If you are interested in checking them out but don't wanna download everything, go with those you won't be disappointed. thank you so much for uploading these! A few ep's here I could never find before, surprised the links still work!